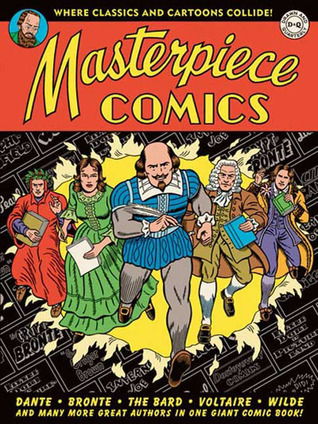 HILARIOUS PARODIES OF CLASSIC LITERATURE REIMAGINED WITH CLASSIC COMICS Masterpiece Comics adapts a variety of classic literary works with the most iconic visual idioms of twentieth-century comics. Dense with exclamation marks and lurid colors, R. Sikoryak's parodies remind us of the sensational excesses of the canon, or, if you prefer, of the economical expressiveness of c HILARIOUS PARODIES OF CLASSIC LITERATURE REIMAGINED WITH CLASSIC COMICS Masterpiece Comics adapts a variety of classic literary works with the most iconic visual idioms of twentieth-century comics. Dense with exclamation marks and lurid colors, R. Sikoryak's parodies remind us of the sensational excesses of the canon, or, if you prefer, of the economical expressiveness of classic comics from Batman to Garfield. In "Blond Eve," Dagwood and Blondie are ejected from the Garden of Eden into their archetypal suburban home; Oscar Wilde's Dorian Gray is reimagined as a foppish Little Nemo; and Camus's Stranger becomes a brooding, chain-smoking Golden Age Superman. Other source material includes Dante, Shakespeare, Dostoyevsky, bubblegum wrappers, superhero comics, kid cartoons, and more. Sikoryak's classics have appeared in landmark anthologies such as RAW and Drawn & Quarterly, all of which are collected in Masterpiece Comics, along with brilliant new graphic literary satires. His drawings have appeared on The Daily Show with Jon Stewart, as well as in The New Yorker, The Onion, Mad, and Nickelodeon Magazine.